As a deadline approached, Century has officially notified Escambia County that the town will accept the terms of a natural gas franchise renewal. The City of Pensacola and Pensacola Energy have objected to the franchise renewal as they claimed much of the franchise area as their own. 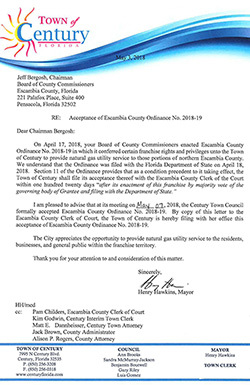 The Escambia County Commission granted the gas franchise agreement on April 17, giving Century 120 days — until August 15 — to approve. The acceptance period was extended from the standard 60 days in order to give Century and Pensacola Energy time to work out a solution to an ongoing dispute over the franchise territory. The Century Town Council formally accepted the franchise renewal on May 7, but did not notify the county at that time. “We had held off filing the acceptance in hopes that a resolution with Pensacola would be reached before the acceptance deadline,” Dannheisser wrote. The Town of Century filed a letter from Mayor Henry Hawkins late last week notifying the county that the town council voted May 7 to accept the agreement. The letter was dated May 3, four days before the council’s actual vote. “We are are hopeful that a resolution will be reached in short order,” the attorney said. In 1968, the Escambia County Board of County Commissioners granted the Town of Century (then known as the Town of South Flomaton) a franchise to provide natural gas services to citizens in the Century area. The present franchise expires this year. The commission adopted a new franchise ordinance that provides the Town with the same rights and responsibilities as other county franchises, including payment of a five percent franchise fee. This new franchise will not extend beyond the franchise area previously designated in the 1968 franchise agreement. The renewed franchise will expire in 2048. But an attorney for the City of Pensacola spoke out against the exclusive franchise before the Escambia County Commission, making a claim that Pensacola Energy already has an exclusive natural gas franchise in North Escambia. 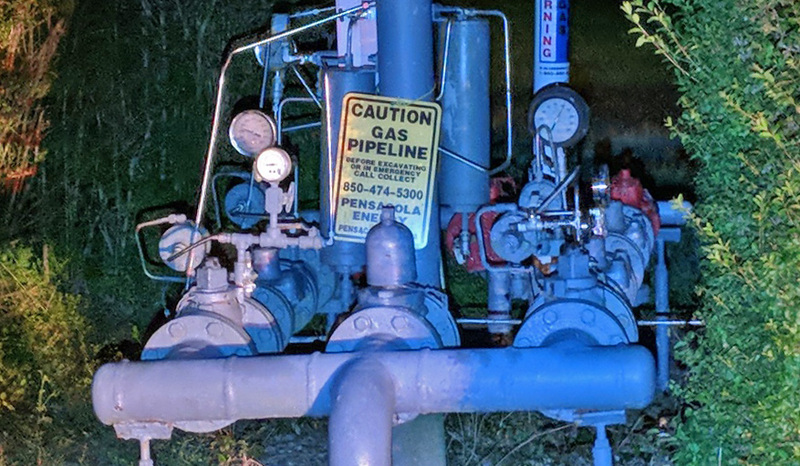 “Since 1993, the City of Pensacola has been providing natural gas service to customers within some of the areas that are in the proposed ordinance that will become an exclusive franchise area for the Town of Century,” attorney Charlie Guyton said. He said Pensacola Energy serves 46 customers within the Century franchise area, adding that service to these customers began after Pensacola in 1992 purchased gas facilities that belonged to the Escambia County Utilities Authorities (now known and the Emerald Coast Utilities Authority) for $1.1 million. Guyton claimed the Town of Century currently only has a license or a permit, but not a franchise to provide natural gas service.. “It does not have a franchise. If you look at the document, there is no mention of a franchise. It does refer to a permit or license. But more importantly, the rights granted under that document are non-exclusive,” he said. Pensacola’s attorney also pointed out that Pensacola has paid, and Escambia County has accepted, an estimated $150,000 in franchise fees from the disputed area. He said Century does have a franchise, which is the same as a permit or license. “They want us to pay them over a half million dollars to buy back the customers that we should already have,” Danneheisser said, customers he contends are paying Pensacola Energy 35 t0 40 percent more than the rate charged by the Town of Century’s gas department. Guyton said that approval of the exclusive franchise would lead to a territorial dispute that would likely go to the Florida Public Service Commission. “And it won’t be just an issue of the franchise, but of who has the better ability to serve. And I think that comparison is going to work in favor of the City of Pensacola,” he said. With the renewal, Century will continue to hold franchise rights from Escambia County to provide natural gas service from the Escambia River westward to almost the Perdido River and from the Alabama state line southward to near Bogia. The franchise area includes Century, Bogia, Byrneville, Bratt, Oak Grove, Walnut Hill and McDavid. Century currently provides gas service only in a portion of their franchise area — near the town limits, south along Highway 29 to and including a portion of Highway 164, west into Byrneville and an area of Bratt. Pictured top: A “natural gas gate station” that serves the Town of Century, located just off Highway 168 on Poplar Dell Road. 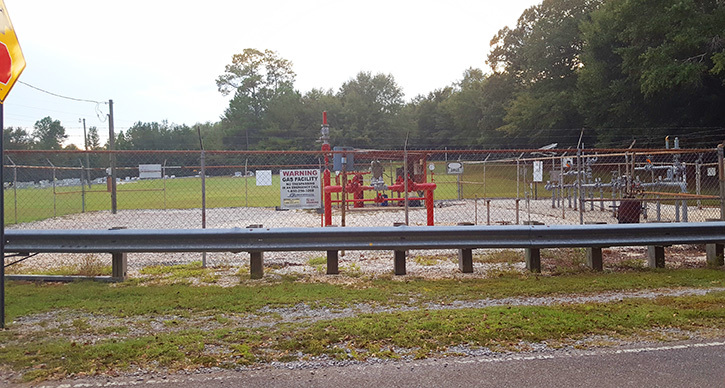 Pictured bottom inset: A Pensacola natural gas valve station in Bratt. Pictured below: A map of Century’s natural gas franchise area. NorthEscambia.com photos and courtesy images, click to enlarge. “Can this administration take up the challenge” that’s a funny one right there. We’re talking about Century, right? This is a prime example of how previous administrations were not resourceful. We have a franchise since 1968 with potential of more customers and instead of using various grant money to expand the gas to accept more customers they stood by and let Pensacola Energy take over. Of course Pensacola Energy is fighting it. They’ve had these customers for 25 years. Can this administration take up the challenge and take back the franchise or is this administration going to sleep through it too? Maybe it’s too late and we have to sell but do a thorough research and see what grant money we have or can get to expand. Pensacola Energy tried to do the same thing to Okaloosa Gas who serves the Molino area. Trying to force Okaloosa out once they were allowed to put gas lines in the area. The price difference is amazing! Almost twice as much with Pensacola Energy. If I had the option to purchase Natural Gas from a vendor other than the City of Pensacola, I would switch in a heartbeat. I have absolutely nothing good to say about the Customer Service provided by ESP or the way they do their billing. Customers are nothing but ATM’s where the CITY withdrawals as much cash as possible. So he wrote the letter May 3 that on May 7 the council voted then they didn’t turn the letter into the county til the deadline after they had to be asked by the county “what gives…and they still didn’t work out selling the franchise and its still losing money. Then the town attorney just says a few words pretending someone is taking care of business when actually they are all just huha . right?